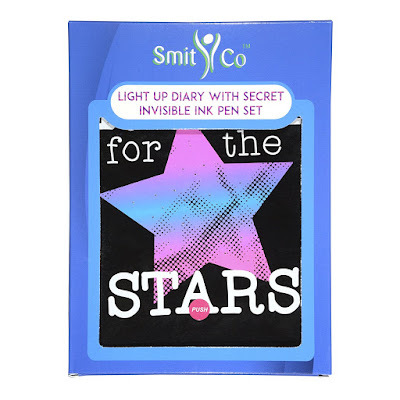 If you follow my blog, then you have probably seen a handful of posts about products for young girls from SmitCo LLC. After stumbling upon their website last year and having them opportunity to try out some of their gifts for girls including journals, jewelry and more, I am a fan, and can't stop raving about SmitCo LLC to family and friends, and recommending it around the holidays, as this company offers gifts for girls of all ages and likes, and each and every product would make for a great gift idea or used as add-ins to birthday party favor bags. This past Christmas I shared a few posts about SmitCo LLC products I included in my holiday gift guide. My review/feature of their new line of light up and passcode protected diaries/journals was well received by readers. I had a handful of readers reach out and thank me for sharing about these light-up journals and how much their grandchildren and children enjoyed them at the holidays. If you missed my post and want to learn more about these light up passcode protected journals/diaries, you can read my post here: https://www.inspiredbysavannah.com/2017/11/holiday-gift-guide-2017-smithco-llc-has.html. Thinking about what items to add to my Easter Gift Guide this year, I kept thinking about SmitCo LLC, and headed over to their website to see what new products were added to their growing collection of gifts for girls. I fell in love with their Mermaid scented Scrapbooking Arts and Crafts Gifts Set and Emoji scented Nail Art Spa Manicure and Pedicure Kit, and knew my girls would love to help me review these two kits. I reached out to the folks at SmitCo LLC and they graciously sent samples of these two kits, along with their popular Reach for the Stars Notebook with invisible ink pen to review and feature in my Easter Gift Guide. My girls continue to write in the journals/diaries we were sent around the holidays. One of the notebooks has become our letterboxing book where we keep all our stamps we find while out letterboxing. The girls love using the invisible ink pen to write where they found each particular stamp. They love how you need to have access to the blue light attached to the pen to read the secret message, making it a fun "just between us" notebook. :-) So, when they saw the new Reach for the Stars notebook, which also comes with an invisible ink pen and only opens with a secret passcode, they were all smiles. Bella was a nice sister and told Savannah she could have this journal, as Savannah was in the ER last night and diagnosed with another bout of pneumonia. Bella thought this light-up notebook would cheer her up, and keep her busy while resting on the couch. It sure as, as Savannah has been laying around doodling and writing in her new Reach for the Stars notebook. She has even written secret messages for Bella to read using her invisible ink pen from one of her other light-up journals from SmitCo LLC. The girls have been passing the notebook back and forth sharing secret sister messages, and giggling. It is nice to see them being loving sisters, and helping perk each other up while sick, as Bella is also dealing with a head cold and asthma flare. 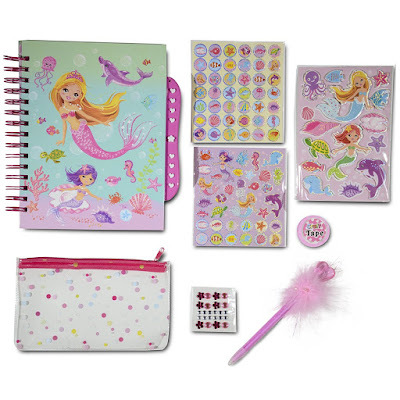 When the girls were done playing with the Reach for the Stars notebook, they decided amongst themselves who would get the Mermaid Scrapbooking Arts and Crafts Gifts Set and who would get the Emoji Nail Art Spa Manicure and Pedicure Kit to use. Bella is all about Emojis so she was quick to call the nail art spa kit and Savannah liked the idea of another notebook that had a scented cover and came with fun tape and scented stickers to use with her new mermaid notebook. 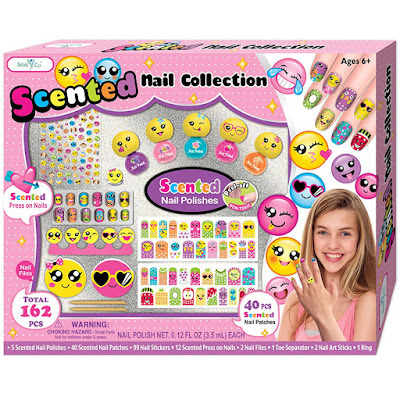 Bella really enjoyed playing with the Emoji Nail Art Spa Manicure and Pedicure Kit, and loved being able to add detail with scented nail stickers and patches and using the wooden stick included in the kit to add swirls and designs with different scented nail polish to her nails. And, if she messed up, I didn't have to rush and grab the nail polish remover, as this nail polish peels right off. Bella thought this was so neat, as she is not a fan of the alcohol in nail polish removers and always says it burns her delicate when I remove nail polish from her nails. Check out the fun Emoji nail art Bella did all on her own. She was so proud of herself and said it looked like a professional nail artist had done it. :-) When asked if this would make for a great Easter basket gift, or birthday gift to give to an Emoji fan, she yelled, "Yes!" She even said it would be a great kit to have for a fun sleepover activity. There is enough scented nail polishes and nail art and accessories to enjoy with friends. 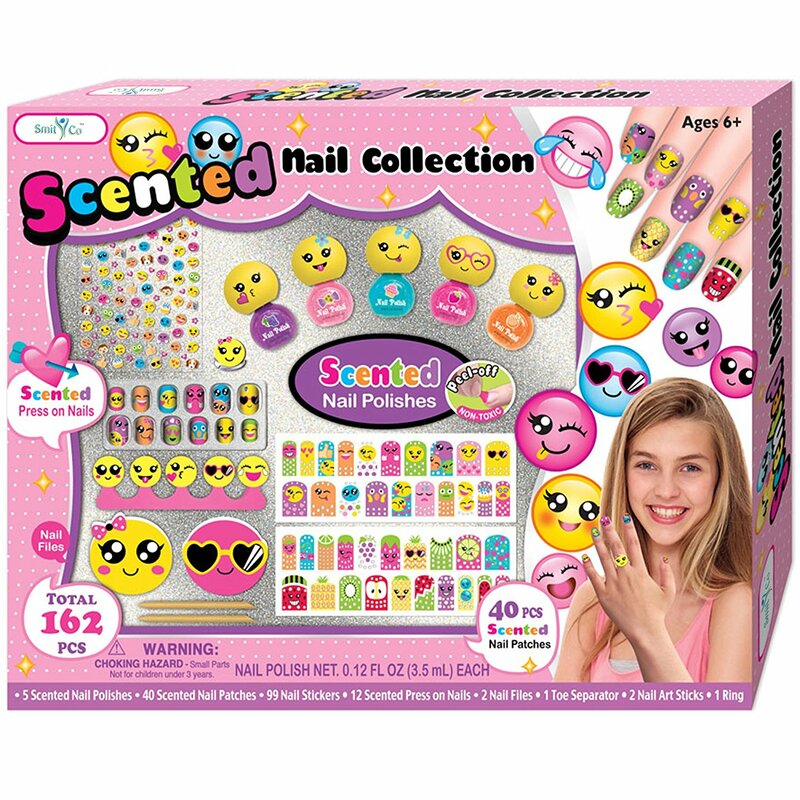 Once the girls are feeling better, Bella can't wait to plan a play date and have her friends come over for a spa day where they will do each other's finger and toe nails with her favorite new scented Emoji nail collection kit from SmitCo LLC. Savannah really enjoyed her Mermaid Scrapbooking Arts and Crafts Gifts Set. She loves ocean creatures and mermaids, so this gift set was right up her alley. As she started pulling all the pieces out of the box that make up this gift set, she couldn't believe how much stuff was included. She saw the 114 pieces on the front of the package, but it wasn't until she layed everything out in front of her on the table that she could see all the wonderful goodies that make up this mermaid scrapbooking set. Even though we are all congested with head colds, we were able to pick up a faint scent to this and Bella's nail set. We know that when we are all feeling better, we will be able to smell the assortment of scented stickers better. My girls had so much fun trying out the two new kits and light up journal today, and I know they will continue to play and use them, as they still use the other sets and journals we received at the holidays on a daily basis. 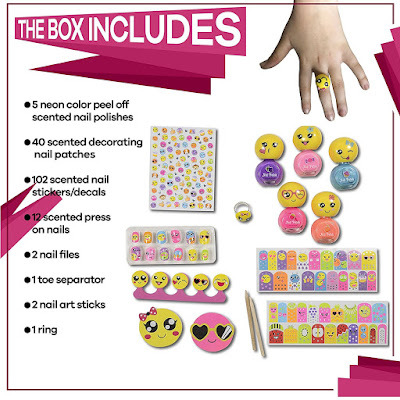 If you are looking for a fun gift to add to your child's Easter basket, why not head on over to the SmitCo LLC Amazon store and check out their collection of notebooks/journals, scrapbooking sets, nail art sets, and more. You can check out all the products available now over at https://www.amazon.com/SmitCo-LLC/b/ref=bl_dp_s_web_9422504011?ie=UTF8&node=9422504011&field-lbr_brands_browse-bin=SmitCo+LLC. I know that once you see these gift sets and journals up close and see how well received they are by that special child in your life, so you will know why my girls and I love SmitCo LLC so much, and I love to feature their products on my blog.